The goal of our paperless office solution is to increase your efficiency and decrease your costs and reduce your liability. The name of the game is efficiency! Printing, getting signatures, creating files and filing all take time…. Not to mention space and money. Never is the saying, “time is money” more true than during Tax Season. 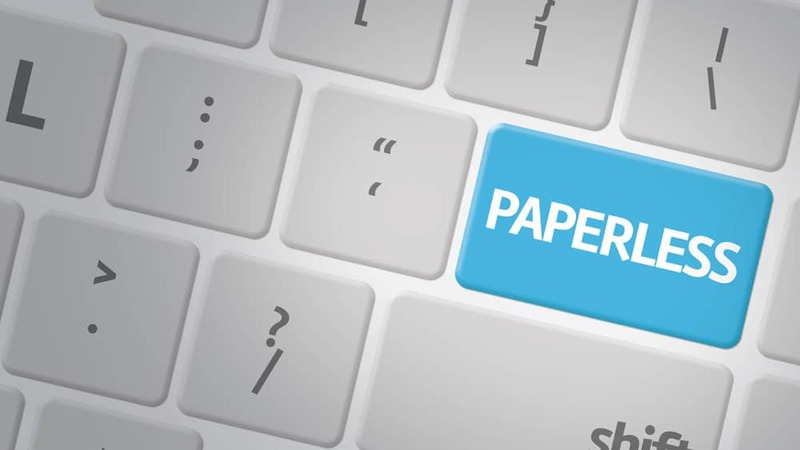 The goal of our paperless office solution is to increase your efficiency, decrease your costs and reduce your liability. A truly paperless office requires 3 elements. The ability to electronically capture signatures, store documents and deliver documents to clients. In other words – SCAN – SIGN – SEND. Each of our software solutions come equipped with it’s own flavor of our paperless solution! 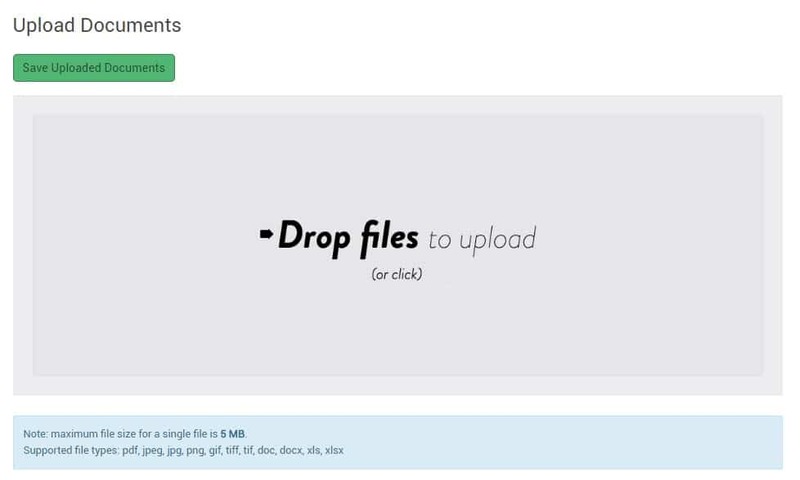 Scan – You can scan, import or snap the images directly into the clients file. What we are really describing here is a secure document management system! As you can see from the image, we wanted to give you options as to what is the most efficient/easiest method of scanning. 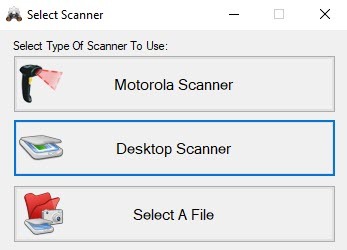 You can use the Motorola DS6707 and take pictures or scan the files directly from your scanner or if somebody was to send you an email with an attachment, just download it and select a file. Sign – Using one of the supported models from Topaz, simply plug in the pad, select something that needs a signature (bank app, 8879 etc.) and have your client scribble on the pad. 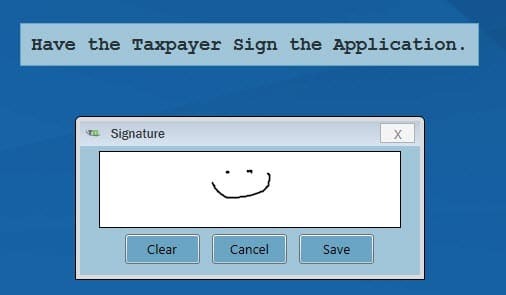 Your signature is already in the system tied to your preparer login, So…just save their masterpiece and anytime you go to print that doc… its signed! 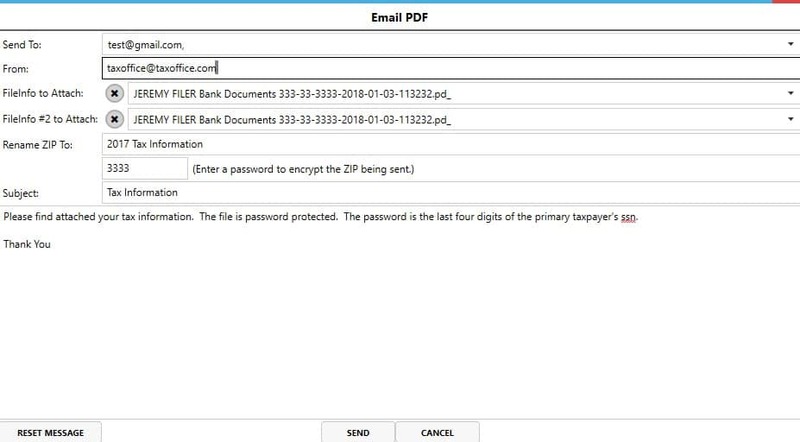 Send – If emailing your clients an encrypted, signed version of their tax return currently takes you more than 30 seconds…. “Houston, We have a problem”. In our system simply click an Icon, attach any scanned docs or their tax return and click send. By default the system will encrypt the file and use the last four of their ssn as the passkey. And just like that… DONE, DONE on to the next one! Almost exactly the same functionality as the desktop paperless office with a little different look and feel. Scan – Being that this is a 100% web based platform, all the documents are stored on our servers. So in the event your office experiences theft, flood or fire, all your documents are securely and safely tucked away in with nothing to fear. This platform does not work with the Motorola DS-6707 but… if you are working from a tablet or smartphone you can actually take a picture and upload from your picture library or browse and just drop them. Sign – If you like using a signature pad, more power to you! If you don’t want to buy them we have developed the ability for you clients to sign with their finger on touchscreen enabled devices or with the mouse of your computer…. No additional equipment required. Click the “sign” button, client signs and save. Easy peasy! 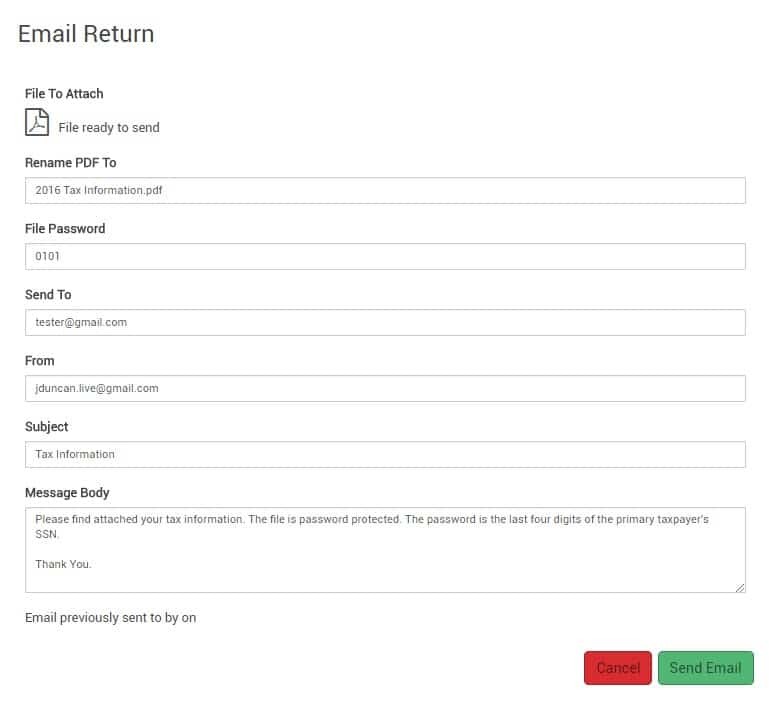 Send – Email your clients their return securely and quickly with 2 clicks. 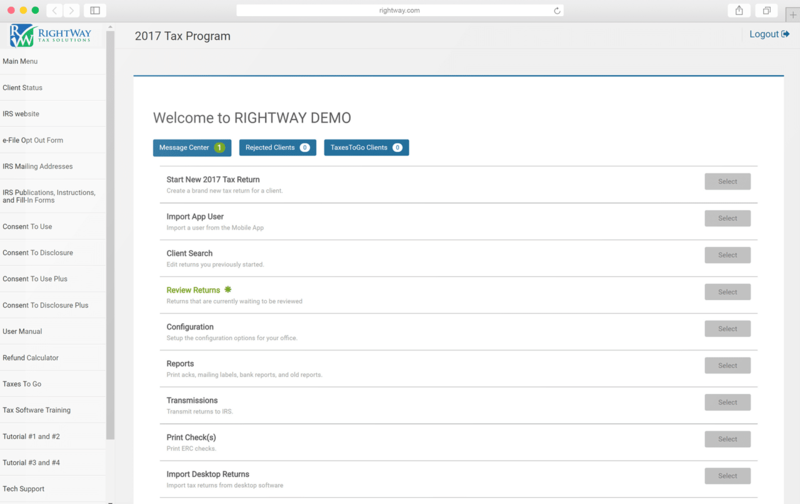 Want to learn more about how our tax office solutions and software can help you grow profits and drive success? Book a demo with one of our team members today for a quick call to get to know your business and learn where we can help you the most. Can your client still file? Desktop – Back that thing up! I signed on for the price; I’ve stayed because of the customer service. With the support of the RightWay team and the introduction of the mobile app has launched my office into another stratosphere. They have my loyalty. Make an appointment with one of our support staff and get a free software demonstration. Give us a call at ‭(866) 240-8629‬ to speak with a sales rep about growing your tax office. See for yourself how our tax office solutions and software can help you grow profits and drive success. Follow us on Facebook for tax updates, business tips, and industry news.